Police in Layton, Utah are investigating a crash they believe was connected to the “Bird Box Challenge.” If you have been sleeping under a rock, this challenge consists of covering one’s eyes while performing tasks just like Sandra Bullock’s character must in Netflix’s hit movie “Birdbox”. The crash happened on the evening of January 7, 2019. The driver, a 17-year-old girl, was driving a pickup truck with a 16-year-old passenger. She pulled her beanie over her eyes while driving. The girl then lost control of her car and skidded along the road into oncoming traffic. Her car ended up hitting another car and a light pole. At first, she told police that her conversation with her friend had distracted her from the road. Nonetheless, police were able to connect the crash to the Bird Box challenge after conducting a few follow-up interviews. The driver of the other vehicle, a 56-year-old man, was one of the other people interviewed by the police. The crash is being investigated, and the police have asked the district attorney’s office to charge the teenager for reckless driving. The Bird Box Challenge involves doing tasks while blindfolded. In Bird Box, the main characters cover their eyes to prevent themselves from seeing a supernatural being. This being causes death to those who see it. In order to survive, the main characters have to perform many tasks throughout the movie, most notably canoeing, while blindfolded. The film’s unique plotline has become a meme and an internet challenge. This original plotline has inspired people to perform potentially dangerous stunts. Its popularity has turned it into a significant safety hazard because of the number of people potentially harmed by these stunts. Photos and videos of people performing this “challenge” can be seen all over the internet, especially on YouTube. Netflix responded to by tweeting on January 2nd, “Can’t believe I have to say this, but: PLEASE DO NOT HURT YOURSELVES WITH THIS BIRD BOX CHALLENGE.” Unfortunately, not everyone has heeded this advisory such as the aforementioned Utah teen. Another big fear I have is pedestrians are taking on this challenge. That is a recipe for death. This story can teach us all an important lesson on avoiding all kinds of distractions while driving. It should be especially an important lesson for teenage student drivers. We can use this as a teaching moment. According to the CDC, about nine people are killed and over one-thousand are injured daily in car accidents involving distracted drivers. Distractions can come in three different forms: visual, manual, and cognitive. Visual distractions usually take one’s eyes off the road. Manual distractions involve putting one’s hands elsewhere besides the wheel. Cognitive distractions involve the lack of mental awareness while driving. The CDC also notes drivers younger than 20 years old are especially at risk for distracted driving. They have the highest rates of fatal crashes where distractions were a significant factor. This statistic highlights the importance of safety first when teaching a teenager how to drive. AAA also provides useful statistics on distracted teen driving. According to the AAA Foundation for Traffic Safety, distractions were a factor in 58 percent of teen crashes studied. Distractions impacted about 75 percent of rear-end crashes. 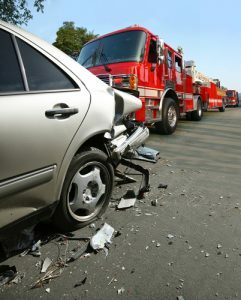 The AAA Foundation notes the most common distraction for teen drivers is using electronic devices such as a cell phone. Another distraction for teen drivers they mention is young passengers. In fact, their study discovered that each additional teen passenger increases the crash risk. These statistics further reinforces the importance of teaching safe driving to teens. Parents are the first line of defense when preventing their teen from distracted driving. They must teach their child early on about the dangers of distracted driving. The first and foremost important thing they must teach is to always keep their eyes on the road. If they cannot see what is in front of them while they are driving, they are at a significant risk of getting into a crash. Their eyes are the most important tool when driving safely on the road. In addition, the most important thing a parent can do for their child is to lead by example. By minimizing one’s own distractions on the road, it can set a good example for their children to emulate good driving habits. Parents can also have their child sign a parent-teen driving agreement. This agreement should include ground rules as what kind of activities are allowed or not allowed while their child operates a vehicle. This includes not playing music at first or not allowing friends in the car once a teen obtains their license. Parents should also ban cell phone use, whether texting or calling while driving. There should also be restrictions on the hours your child is allowed behind the wheel. In addition, it should also include consequences for violating ground rules. They should include losing driving privileges for a certain amount of time such as a week or a month. Having a written agreement can help a teen take distracted driving more seriously. I don’t have kids who can drive yet. Will I do this with my kids? I don’t know. But it sure is a great idea.